Prime Minister Shinzo Abe on Thursday reiterated his push for a revision of the Constitution to formalize the legal status of the Self-Defense Forces, despite his dream to revise the charter having been increasingly overshadowed by a recent spate of scandals that have paralyzed the Diet and dominated domestic headlines. “We must codify the status of the SDF, which protects Japan’s independence and peace, and put an end to talk of their unconstitutionality,” Abe said in a video message shown at a gathering organized by a citizens’ group with ties to right-wing lobbyist group Japan Conference (Nippon Kaigi). Thursday marked the 71st anniversary of the entry into force of the Constitution, which nationalists here regard as a humiliating imposition by the U.S.-led occupation. “It’s time — we should tackle constitutional revision,” the prime minister said. 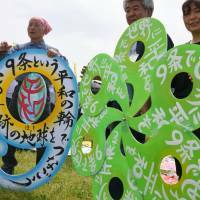 Abe’s message largely echoed one he delivered a year ago at the same event. In last year’s message, he suggested to the surprise of many that war-renouncing Article 9 — a linchpin of the Constitution — should be altered by 2020 to include a new paragraph formalizing the status of the SDF, Japan’s de facto military. The pro-revision event on Thursday drew an estimated turnout of 1,200, according to its organizer. The same day in Tokyo, and elsewhere nationwide, opponents of constitutional revision staged their own rallies. One of the biggest was held in the Ariake district of Tokyo. Organizers for the event — a joint effort by five civic groups — put the turnout at an estimated 60,000. The protest was attended by leaders of opposition parties, including the Constitutional Democratic Party of Japan and the Democratic Party. Instead of going into detail on issues related to the Constitution, opposition heads took the opportunity to pan the Abe administration for what they see as its lack of accountability for recent scandals. Yukio Edano, head of the CDP, slammed the prime minister for “abusing power” and forcibly passing a number of controversial bills while ignoring the public and the Constitution. “The Constitution doesn’t give those elected the right to pass any legislation that they want,” he said. Meanwhile recent media polls suggest no national consensus has yet formed over Abe’s proposal to revise the key Article 9. 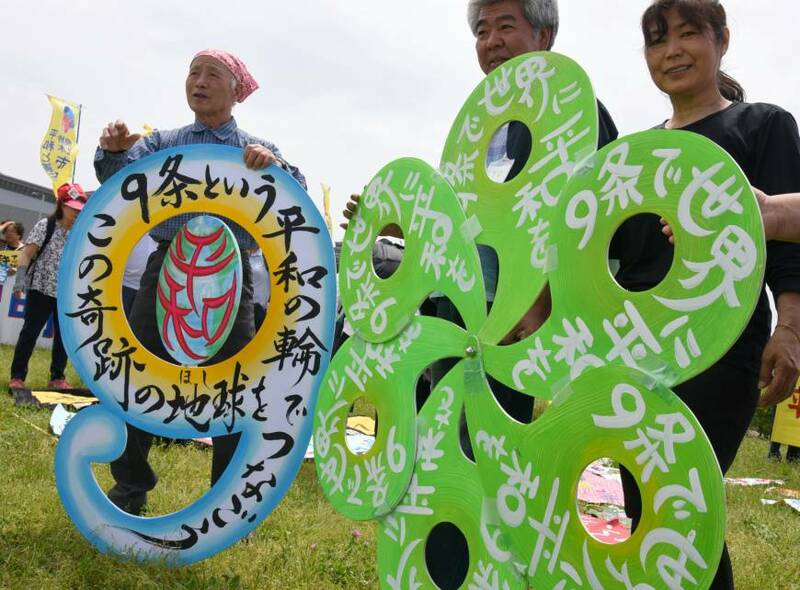 The latest poll, conducted by NHK from April 13 to 15, showed 39.7 percent — the highest proportion — of 1,891 respondents were now unable to say clearly whether they support or oppose the LDP’s proposal to formalize the status of the SDF. Those who said they support the move accounted for 31.1 percent, while 23.3 percent oppose it. The same NHK poll also asked whether Abe should promote debates overconstitutional revision or prioritize other issues instead. Some 68.3 percent said Abe should prioritize non-constitutional issues, while only 19.2 percent said constitutional issues should be given priority. Abe’s rationale is to put an end to scholarly disagreements over the constitutionality of the SDF, which boasts one of the world’s largest defense budgets and is regarded by some as being in violation of the strictly pacifist Article 9. The government, however, has maintained for decades that the SDF is constitutional. Liberal intellectuals have argued Abe merely proposed what he believed to be the easiest way to alter Article 9 in apparent pursuit of “revision for the sake of revision,” sidestepping more hawkish draft changes proposed by the Liberal Democratic Party in 2012 when it was in opposition. By codifying the status of the SDF, “it’s obvious that we can clarify their legitimacy, which is something that affects the foundation of our nation. This, I think, constitutes enough reason to amend the Constitution,” Abe argued in Thursday’s video message. But whatever momentum Abe may have had for constitutional revision earlier this year — when he was still riding high after successfully steering the LDP to a resounding victory in the October general election — has fast diminished, hit in recent months by a number of scandals. Those scandals include two separate incidents of alleged government cronyism, related to school operators Moritomo Gakuen and Kake Gakuen. The revelations have pushed down the support rate for Abe’s Cabinet and brought questions over whether he will be able to win re-election as party leader in the LDP’s presidential election in September. The Diet remains at a standstill as opposition parties mount a joint boycott of its sessions in protest against the scandals, which also include sexual harassment allegations against the former top Finance Ministry bureaucrat and reports of data cover-ups within the Defense Ministry. With the opposition preoccupied with seeing those scandals addressed, a Diet panel tasked with discussing constitutional revision has not convened in the Lower House during the current legislative session. Only once, in February, has it held a session in the Upper House. And further confounding Abe on his quest for constitutional revision is the tepid support he’s seen from the LDP’s coalition partner, Buddhist-backed Komeito, which has traditionally maintained a cautious attitude toward revising Article 9. Aside from Article 9, the party also seeks to establish clauses allowing the state to declare a state of emergency in the event of a natural disaster, guaranteeing free education and eliminating Upper House electoral districts that combine more than one prefecture.